I was looking for a small, non-plastic chest to organize my sewing room fabric stash. This piece fit my size requirements in width and height, and seems to be well made over-all. The color is a creamy shade of white (as opposed to a bright white)-- also perfect for my room. The thing I don't like are the baskets, which are made of loosely-woven rattan and are difficult to pull out, as others have mentioned. I plan to make muslin basket liners and to put stick-on cork on the wood, and that should solve the pull out problem. Be aware that inside the wood structure, under where the baskets go, there is only a 3/4" frame supporting each basket. It doesn't appear to be an issue, and in fact, makes the piece a lot lighter. But you don't want to put anything really heavy in those baskets. 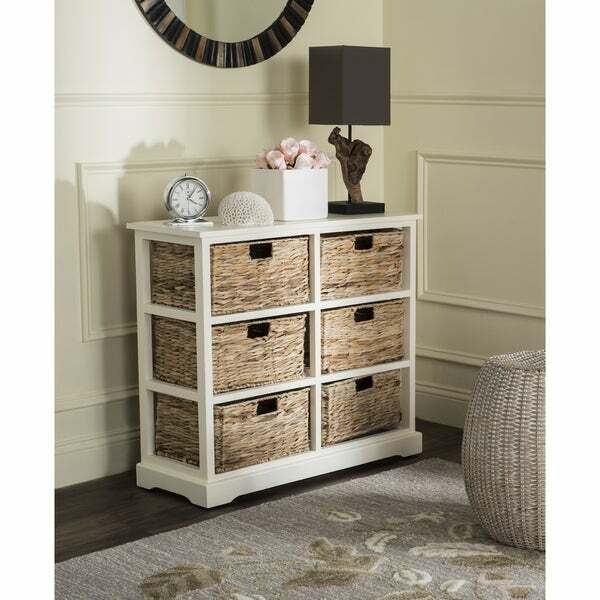 Safavieh Keenan Distressed White 6-Drawer Wicker Basket Storage Chest - 32.1" x 13.4" x 29.5"
Safavieh Vedette Distressed White 5-drawer Wicker Basket Storage Tower - 17.3" x 13.4" x 46.1"
This charming 6-basket storage chest easily complements both urban and rural settings. Keep clutter tucked away in the bedroom or bathroom to store linens, towels, toiletries, clothing, shoes, or books. In the family room, store media accessories and electronics or extra blankets. Its gorgeous distressed white color allows for seamless integration into existing decor, and showcases its contemporary and functional design. Crafted of sturdy pinewood and pre-assembled, this convenient piece has been designed to make organization a breeze. This piece of furniture looks just like the picture. It is well made and needed no putting together. The baskets are nice and great for storage. We bought this for my daughter's room and she loves it. The only complaint I have is that the baskets don't slide well so are not super easy to open and close. Fine for storing things you don't use often, but wouldn't be great for something you want to be getting into all the time. The baskets also kind of "shed" so there is always small parts of material on the floor. 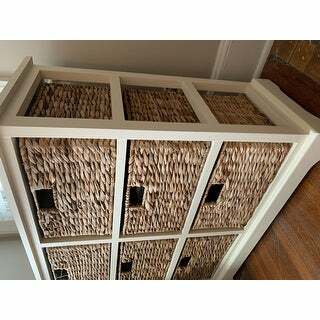 Affordable and well constructed storage chest which comes with the sturdy wicker baskets. The best part is that it comes together so there is no frustration putting it together. I bought this piece for an empty wall in a guest bedroom so the size was perfect and the colors match any furniture. Highly recommend this piece of furniture. The best thing about this piece is that it requires absolutely NO ASSEMBLY! The white frame is sort of an antique white. Blends easily with both bright white and cream. The basket drawers are a perfect fit for a small woman's clothing. They don't slide in and out very smoothly though. However, I assume they will loosen up with use. My favorite part is that is comes already assembled. The description says that it is white, but the color is more of a cream than a bright white.. the baskets are also quite cheap and stick when you try to slide them. It’s fine for storage, but don’t buy this item if you plan on using the baskets often. Although slightly smaller than expected, the storage chest fits perfectly in my bedroom and it frees up space in my bureau drawers for other items. I'm using it for socks, underwear, etc. The color is an off white which is what I wanted and it came fully assembled which was a plus. I am very happy with my purchase. Arrived fully assembled so all I had to do was slide it out of the box and into place. The wood frame seems nicely made and the basket drawers all fit and are sturdy looking. Love this highly functional drawer set. It’s a beautiful addition to my already furnished guest room and offers extra storage. Love them! Bought two of them for nightstands. They work great and look beautiful. Have an beach decor feel. Would consider Safavieh Keenan furniture in future. 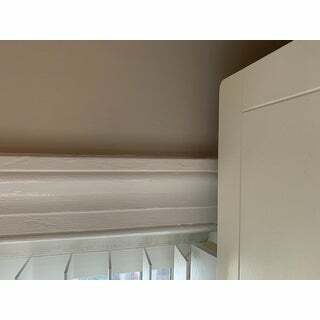 Was looking for a cabinet that would fit in our lower part of closet to keep towels etc in. This fits perfectly. Fits in nicely with the beach feel. Only issue I see is the baskets shed a little but I would buy again if needed. Has a weathered look on wood which I like. This small dresser was exactly as described. It is cheaply made, but sturdy enough. The baskets are rough and the caning (?) is ragged. You get what you pay for and this was inexpensive. I really like the way this looks and it comes in a box ready to use. The reason I only gave it 3 stars is because it is hard to pull the drawers out they stick the whole time your pulling them. This is exactly what I needed to store all the dog necessities for trips out doors. Leashes, treats, coats, etc. It is a perfect size and looks fantastic. Cubes are very sturdy. Best part it was delivered fully assembled. The baskets are difficult to move in and out. However, it’s really nice quality and looks great in my living room. "is there a shelf under the basket i.e can it be used without the baskets ?" The baskets are free floating, and the chest can be used without the baskets. There is no shelf under the baskets. I don't think you could use this without the baskets. There is not a shelf under the baskets, I don't know how you would work it without the baskets. It's perfect for my art supplies. "What is the size of the baskets (individually)"
Hello justchrist6, the basket dimensions are : 12.2 X 11.2 X 4.5. Have a great day! Safavieh Vedette Winter Melody 5-drawer Wicker Basket Storage Tower - 17.3" x 13.4" x 46.1"